This article is about the British aircraft manufacturer. For other uses, see Avro (disambiguation). Avro was founded in 1910 by Alliott Verdon Roe at the Brownsfield Mill on Great Ancoats Street in Manchester. The company remained based primarily in Lancashire throughout its 53 years of existence, with key development and manufacturing sites in Alexandra Park, Chadderton, Trafford Park, and Woodford. The company was merged into Hawker Siddeley Aviation in 1963, although the Avro name has been used for some aircraft since then. One of the world's first aircraft builders, A.V. Roe and Company was established on 1 January 1910 at Brownsfield Mill, Great Ancoats Street, Manchester, by Alliott Verdon Roe and his brother Humphrey Verdon Roe. Humphrey's contribution was chiefly financial and organizational; funding it from the earnings of the family webbing business and acting as managing director until he joined the RFC in 1917. Alliot had already constructed a successful aircraft, the Roe I Triplane, named The Bullseye after a brand of braces manufactured by Humphrey. In 1911, Roy Chadwick began work as Alliott's personal assistant and the firm's draughtsman and in 1918 he was appointed Chief Designer. 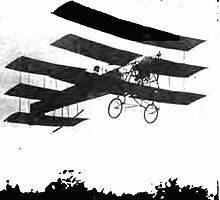 The first Avro aircraft to be produced in any quantity was the Avro E or Avro 500, first flown in March 1912, of which 18 were manufactured, most for the newly formed RFC. The company also built the world's first aircraft with enclosed crew accommodation in 1912, the monoplane Type F and the biplane Avro Type G in 1912, neither progressing beyond the prototype stage. The Type 500 was developed into the Avro 504, first flown in September 1913. A small number were bought by the War Office before the outbreak of the First World War, and the type saw some front-line service in the early months of the war, but it is best known as a training aircraft, serving in this role until 1933. Production lasted 20 years and totalled 8,340 at several factories: Hamble, Failsworth, Miles Platting and Newton Heath. After the boom in orders during the First World War, the lack of new work in peacetime caused severe financial problems and in August 1920, 68.5% of the company's shares were acquired by nearby Crossley Motors which had an urgent need for more factory space for automotive vehicle body building. In 1924, the company left Alexandra Park Aerodrome in south Manchester where test flying had taken place since 1918; the site was used for a mixture of recreation and housing development. A rural site to the south of the city was found at New Hall Farm, Woodford in Cheshire, which continued to be used by aviation company BAE Systems until March 2011; the site has now been earmarked for a mixed use development. In 1928 Crossley Motors sold AVRO to Armstrong Siddeley Holdings Ltd. In 1928 A.V.Roe resigned from the company he had founded and formed the Saunders-Roe company, which after World War II developed several radical designs for combat jets, and, eventually, a range of powerful hovercraft. In 1935 Avro became a subsidiary of Hawker Siddeley. Maintaining their skills in designing trainer aircraft, the company built a more robust biplane called the Avro Tutor in the 1930s which the Royal Air Force (RAF) also bought in quantity. A twin piston-engined airliner called the Anson followed but as tensions rose again in Europe the firm's emphasis returned to combat aircraft. The Avro Manchester, Lancaster, and Lincoln were particularly famous Avro designs. 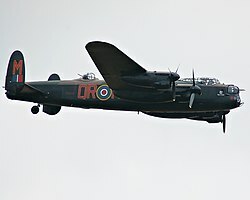 Over 7,000 Lancasters were built and their bombing capabilities led to their use in the famous Dam Busters raid. Of the total, nearly half were built at Avro's Woodford (Stockport) and Chadderton (Oldham) sites, with some 700 Lancasters built at the Avro "shadow" factory next to Leeds Bradford Airport (formerly Yeadon Aerodrome), northwest Leeds. This factory employed 17,500 workers at a time when the population of Yeadon was just 10,000. It was the largest building in Europe at the time, at 1.5 million square feet, and its roof was disguised by the addition of fields and hedges to hide it from enemy planes. The old taxiway from the factory to the runway is still evident. The Avro Lancaster carried the heaviest bomb loads of the war, including the Grand Slam bomb. The civilian Lancastrian and maritime reconnaissance Shackleton were derived from the successful Lancaster design. The Tudor was a pressurised but problematic post-war Avro airliner which faced strong competition from designs by Bristol, Canadair, Douglas, Handley Page, and Lockheed. With the same wings and engines as the Lincoln, it achieved only a short (34 completed) production run following a first flight in June 1945 and the cancellation of an order from BOAC. The older Avro York was somewhat more successful in both the RAF and in commercial service, being distinguished by a fuselage square in cross-section. Both Tudors and Yorks played an important humanitarian part in the Berlin Airlift. The postwar Vulcan bomber, originally designed as a nuclear-strike aircraft, was used to maintain the British nuclear deterrent, armed with the Avro Blue Steel stand-off nuclear bomb. The Vulcan saw service as a conventional bomber during the British campaign to recapture the Falkland Islands in 1982. Several Vulcans are prized as museum exhibits. A twin turboprop airliner, the Avro 748, was developed during the 1950s and sold widely to airlines and governments across the globe, powered by two Rolls-Royce Dart engines. The RAF bought 6 for use by the Queen's Flight and a variant with a rear-loading ramp and a "kneeling" main undercarriage was sold to the RAF (31 aircraft) as the Andover. The Avro name would subsequently be resurrected by British Aerospace when this aircraft manufacturer renamed its BAe 146 family of regional jetliners as Avro regional jets (Avro RJ). Three differently sized versions of the four engine jetliner were produced: the Avro RJ70, the Avro RJ85 and the largest example, the Avro RJ100. When the company was absorbed into Hawker Siddeley Aviation in July 1963, the Avro name ceased to be used. The brand still had a strong heritage appeal, and as mentioned above the marketing name "Avro RJ" (regional jet) was used by British Aerospace from 1994 to 2001 for production of the RJ70, RJ85 and RJ100 models which were respectively based on the BAe 146-100, BAe 146-200 and BAe 146-300. This four engine jet aircraft type is sometimes also loosely called the "Avro 146". The BAe ATP (Advanced Turbo Prop) design evolved from the Avro 748 and examples continue in use on shorter, mainly domestic, scheduled air services. A few Avro 504s, Tutors, Ansons and Lancasters are maintained in flying condition as reminders of the heritage of this influential English company. At 39 years, the noisy but impressive Shackleton held the distinction of being the aircraft with the longest period of active RAF service, until overtaken by the English Electric Canberra in 1998. Avro 509 – proposed twin engined tractor biplane seaplane, not built. Avro 513 – proposed twin engined tractor biplane seaplane, not built. Avro 674 - 24 modernised Hawker Audaxes built for the Egyptian government. Avro 720 – planned rocket interceptor, to OR.301 as for the SR.53. Cancelled before flight. Avro 771 – proposed 60-seat airliner powered by two Bristol Siddeley BS.75 turbofans. Avro also built motor vehicles in the immediate post-World War 1 era, including the three-wheeler Harper Runabout, as well as their own light car. Powered by a 1,330 cc 4-cylinder engine, wood and aluminium were used in an integral construction similar to an aircraft. Approximately 100 were built. In 1927 Alliott Verdon-Roe designed a two-wheeler car powered by a 350 cc Villiers air-cooled engine. An outrigger wheel kept the car upright when stationary. The Mobile did not go into production. Avro F.C. was founded at the Chadderton factory and still exists today. ^ "H.V. Roe." Flight, 4 August 1949, p. 145. ^ Bowyer, Laura (19 June 2013). "Motion to celebrate Leeds factory's war efforts". Yorkshire Evening Post. Retrieved 20 June 2013. ^ Campagna 2003, p. 19. ^ "Avro 771 and BAC-107". Flight International: 449. 16 September 1960. Baldwin, Nick. A-Z of Cars of the 1920s. Bideford, Devon, UK: Bay View Books, 1998. ISBN 1-901432-09-2. Harlin, E.A. and G.A. Jenks. Avro: An Aircraft Album. Shepperton, Middlesex, UK: Ian Allan, 1973. ISBN 978-0-7110-0342-2. Wikimedia Commons has media related to Avro aircraft.